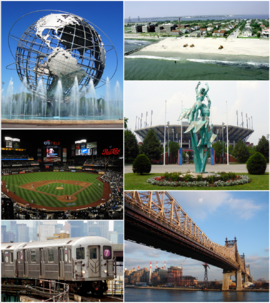 Queens is the easternmost and largest in area of the five boroughs of New York City, geographically adjacent to the borough of Brooklyn at the western end of Long Island. Coterminous with Queens County since 1899, the borough of Queens is the second-largest in population (behind Brooklyn), with a Census-estimated 2,321,580 residents in 2014, approximately 48% of them foreign-born. Queens County is also the second most populous county in New York State, behind neighboring Kings County, which is coterminous with the borough of Brooklyn. Queens is the fourth-most densely populated county among New York City’s boroughs, as well as in the United States; and if each New York City borough were an independent city, Queens would also be the nation’s fourth most populous city, after Los Angeles, Chicago, and Brooklyn. Queens is the most ethnically diverse urban area in the world. Queens has the second-largest and most diversified economy of all the five boroughs of New York City; the borough is home to two of the three busiest New York City metropolitan area airports (and both major airports in New York City proper), JFK International Airport and LaGuardia Airport. These airports are among the busiest in the world, causing the airspace above Queens to be the most congested in the country. Attractions in Queens include Flushing Meadows Park—home to the New York Mets baseball team and the US Open tennis tournament—Kaufman Astoria Studios, Silvercup Studios, and Aqueduct Racetrack. Queens was established in 1683 as one of the original 12 counties of New York and was named for the Portuguese Princess Catherine of Braganza(1638–1705), who was at the time queen of England, Scotland, and Ireland. Queens became a borough of New York City in 1898. From 1683 until 1899, the County of Queens included what is now Nassau County.